Calvary wasn’t what I was expecting. The trailers sold it as a dark comedy with a bunch of weird, small town characters. The film is definitely funny in parts, but it is also deep and emotional as it plunges one man into darkness. 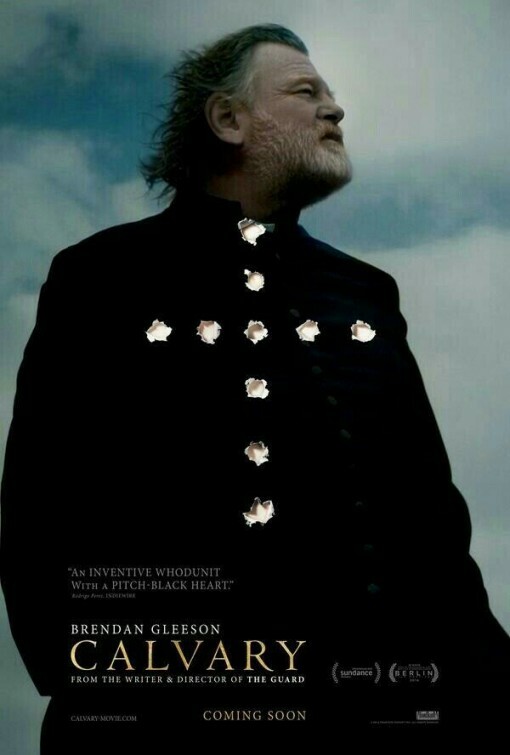 The film, written and directed but John Michael McDonagh, focuses on Father James (Brendan Gleeson), a Catholic priest tending to his flock in a small village in Ireland. At the start of the film, a man comes to confession and tells James that he is going to kill him in a week’s time, not because he’s a bad priest, but because he’s a good one. It’s a punishment, as the man was abused as a child by a priest. So, James sets to putting his house in order, while coming to the conclusion that he isn’t as well-regarded in his community as he’d thought. He also takes measures to defend himself and puts his faith in God, even as it is shaken on all sides. All the while, the audience is trying to guess who intends to do Father James harm. As Father James goes about his week, we learn more and more about his past, as do the people in the community. What results is a meditation on community, secrets, and the place of faith in today’s society. This movie is all Gleeson. His easy humor blends well with his imposing figure. I don’t want to give too much away, but suffice to say, you get to see all sides of Gleeson as he plays Father James. It was fascinating to watch him take control of this character and deliver a fantastic and nuanced performance. With some of the events in this film, one might think that McDonagh is saying there’s no place for someone like Father James in the modern world, but the final scene quashes that sentiment. The rest of the cast is equally fantastic. Chris O’Dowd surprises with his typically good-natured performance, but tinged with darkness. He seems to be coming out of his man-child roles of the past. Kelly Reilly does fine work as Fiona, the new girl in town, while Aidan Gillen is great as the atheist surgeon, Frank. Gleeson’s real-life son, Domhnall Gleeson makes an appearance as a failed member of James’ flock, which was a nice surprise. Orla O’Rourke plays the cheating Veronica with a devil may care attitude and Killian Scott is hilariously odd as Milo. Finally, M. Emmett Walsh turns up as an American writer and friend of James. It was good to see him still kicking around. Overall, while Calvary wasn’t exactly what I was expecting, I liked it a lot. It is both an emotional character piece as well as a compelling mystery. The ending is very powerful and there’s plenty of humor throughout. If it’s playing in your area and you’re looking for an antidote to summer blockbusters, check it out. This entry was posted in Movies, Reviews and tagged 2014, Aiden Gillen, Brendan Gleeson, Calvary, Chris O'Dowd, Film Reviews, Films, Hodgepodge, John Michael McDonagh, Movie Reviews, Movies, Podcast, Reviews. Bookmark the permalink.